A humongous crowd greeted Priyanka Gandhi Vadra, general secretary of Congress in charge of Uttar Pradesh, at Silchar in Assam on Sunday. 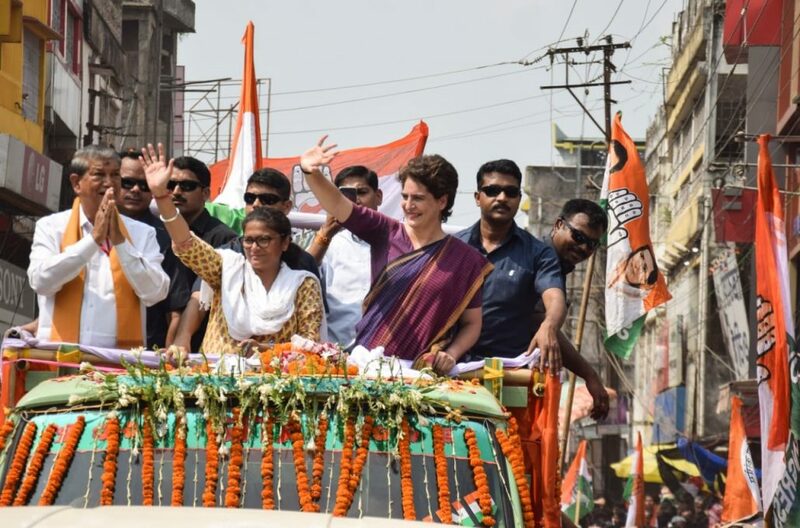 Priyanka stole the hearts of more than 2 lakh people who held a roadshow at Silchar. She was here to drum up support for Sushmita Dev, Congress candidate for Silchar Lok Sabha seat. Making a veiled hint at the Citizenship (Amendment) Bill, 2016, she remarked that the Modi government was trying to bring in “amendments that are not at all people-friendly”. “During my travels across UP over the last two months, I observed how the youth are unemployed, the farmers are distressed and women unsafe. Similarly, there are many issues in your constituency that have not been solved… despite their wide-scale campaigning,” she added. “Priyanka Gandhi coming and campaigning in Silchar will make our win easier,” said an optimistic Abhijit Pal, general secretary, Congress. “Priyanka’s popularity is nation-wide. Being the All-India Mahila Congress president, I requested her and Rahul Gandhi to help by supporting me. Their visit will help enthuse supporters,” Sushmita said. Assam finance minister Himanta Biswa Sarma, has compared Sushmita Dev to Pakistan and said “there is no work for her in the constituency”. “PM is Modi, CM is Sonowal, I am the minister, Kishor Nath is MLA here. In between this, what is the job of Sushmita Dev? Everywhere is India, but there is a Pakistan in between. Will it work? No work will happen,” Himanta stated. Addressing a public rally at Barkhola (in Barak Valley) in support of BJP candidate Rajdeep Roy, Sarma said voting for Sushmita will drag Silchar backward by five years. “Voting in favour of PM Modi will be for development of the country, the state and Silchar,” he added. “You can see that Sushmita Dev is very nervous. First, she brought Rahul Gandhi, then Pakistan PM Imran Khan’s friend Navjot Singh Sidhu. Now, she has brought Priyanka Gandhi Vadra. She knows that she did nothing in the last five years and is sure to lose,” Sarma claimed. This was Priyanka’s first campaign trip outside Uttar Pradesh in the 2019 Lok Sabha polls. The roadshow started from Silchar’s Sadarghat and culminated in the Rangirkhari area. Sushmita is the president of All India Mahila Congress. She is facing anti-incumbency factor for which she has roped in Priyanka to be the star campaigner. Last week, the Congress chief Rahul Gandhi had also come out in support of Sushmita Dev, during a rally in neighbouring Karimganj constituency. Silchar will vote in the second phase of Lok Sabha polls on April 18 next. Earlier, embarking at Silchar’s Kumbirgram tarmac, Priyanka first took the blessings of the goddess at Kachakanti temple in Udharbond. She was accompanied by Sushmita Dev.